One of the responsibilities of tour operators/ game lodge owners, in my opinion, is passing on a conservation ethic to our guests. It is well and good to provide brilliant game-viewing opportunities along with real African experiences but we would be failing dismally if our clients leave without having learned about conservation and its many associated challenges. A simple example comes to mind : we need to discourage littering. Our lodge staff needs to set an enviable example in this respect by ensuring all plastic items, however small, are removed. Whenever I go on a bush walk along the Olifants River, I actively look for any plastic bottles or bottle tops that may have been washed down from upstream locations. I bring these back to Tremisana and get them to the incinerator asap. I applaud the Kenyan government that has forbidden the use of plastic bags – I wish the same could happen in our country. Unfortunately, it can get problematic. Recently I had to deal with an agent who informed me about a guest complaint of a “dirty” toilet bowl and shower floor. All our lodges use underground water sourced via borehole. This water contains a significant amount of calcium carbonate. On the way from Johannesburg to our lodges, we pass a Tufa waterfall near the tunnel. This type of waterfall grows forwards as a result of deposits of calcium carbonate. At our lodges there are similar deposits. I taught chemistry for many years and know very well that hydrochloric acid neutralises calcium carbonate. The problem is that any excess acid that finds its way into the septic tank may well, through seepage, contaminate the environment. Perhaps we need to put up a notice that the ceramic is not dirty – in fact it has a lime deposit – and that we are not too happy to add acid that does environmental damage. We also limit the amount of acid introduced to geyser elements that become coated with lime and are thus rendered ineffectual. The Kruger Park also does its bit in assisting with litter. All tourists that enter the Park are supplied with brown paper bags into which all litter can be placed. It is really very disheartening to drive in pristine game reserves and see bottles and cold drink tins thrown into the bush by shockingly uncaring tourists ! This month has brought some exciting sightings. For a few days at Tremisana we were blessed with wonderful sightings of our local lion pride, the Takazile pride, after they killed an impala near Tremisana Lodge. For a day or two we could easily go view them at close range while they rested in the shade. 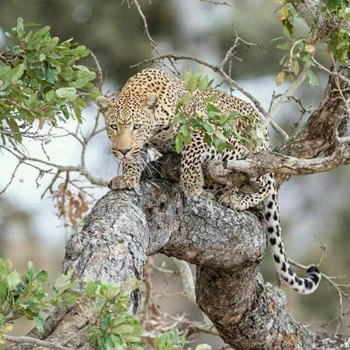 One drive in particular stood out as we were lucky enough to view lions, elephants, black rhino cow with a calf, hyenas, honey badgers, porcupine, small spotted genet, and an African wild cat! Personally I was most excited about the wild cat, given just how rare they are. Kruger also delivered good sightings. We were able to watch a pair of lionesses take over an ostrich kill from a pair of cheetahs. After conceding their hard earned prize, the cheetah found some shade about 500m from the kill to rest up. This meant that for a while we could see both the lions and the cheetah from a single spot. The bush walks from Tremisana have been wonderful as always. We were particularly fortunate on a number of walks, during which we encountered elephant and giraffe, sometime both, on foot. One walk I believe we were close to finding a leopard. After hearing Impala alarm calling atop a nearby ridge, I went to investigate and found a large herd of Impala and a group of Waterbuck all standing together, all staring in the same direction. Unfortunately by the time we had made it up the ridge after reporting back to the guests, everything had settled down again. Despite that it made for an interesting walk. It’s Elias , Hello, how are you doing ? Halala ! It’s happening again at Tremisana lodge – I was doing a Sunset drive along Marula road and we saw a female black rhino and the baby – it was a great day for me and my guests ! On our drive we also saw impalas, giraffes, kudu, duiker and waterbuck. While we were eating at Marula Boma we saw honey badgers and a genet. On another day, after searching for some time we finally came across 3 beautiful lionesses by Tremisana Dam lying under an acacia tree. On another sunset drive 5 lionesses were walking near the Olifants River. It was a great experience for my guests to see that. When I looked behind me I saw a lady being emotional – I asked why and she said it was her first time to see wild lions ! I was happy for her because she finally fulfilled her dream. On most of our bushwalks this month, we saw elephants, impalas, waterbuck, kudu and hippos. 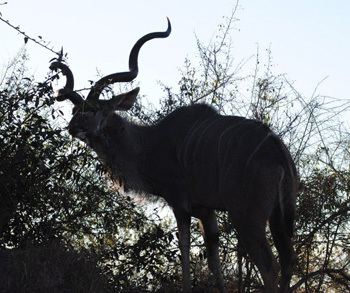 Kudu bull seen on Bush Walk near Olifants River. The other day I was doing a bushwalk and we saw a big elephant bull really close – it was amazing how close you can be as long as you respect them and check the wind direction. The guests that I had were surprised and amazed. I told them that that particular elephant, Ezulwini, is an old man. But you need to give him a space and respect. He is one of a loveliest, coolest elephants but we must respect him. 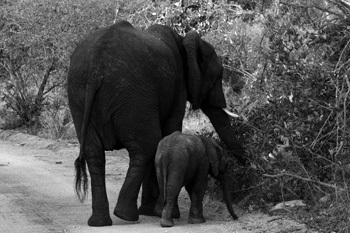 On our bushwalks this month, it happened several times that we found lots of elephants. On one walk, Rex and I found an entire herd of them. Elias has been improving his tricks and so this month while doing bushwalks all of our guests have been taught how to make bangles braided with some Mother in Law’s tongue fibre. Bushwalk isn’t just about approaching big 5, it is an educational activity, and we always try to bring people closer to nature and describe all medicinal use for plants. We show the impact that something as tiny as a termite or as big as an elephant leave behind out in our beloved Bushveld. For all of you that came and had me as a guide, everyone knows that my horse (Cruiser) has a name « Doris », so it was just a quiet morning with some lovely guests when all of a sudden Doris broke down – luckily for us Ed ( one of our guides ) came to the rescue ! Right next to us, in a dead Leadwood was an African Brown Snake Eagle, so we at least got to spend some quality time watching him. The heat has come back, and going out on afternoon drives can be very tiring. On one afternoon, after driving a very long time, we went on to Barnard and managed to locate herds of elephants coming out from the dam ; they all came past our Cruiser giving us great photography opportunities. One of my latest afternoon drives, we’ve been blessed by finding one of my absolute favourites : Black Rhinos. As we were driving we spotted this 1 big rhino next to that smaller grey bottom. The female picked up on us very fast, as she has her newborn baby, she is even more careful and more vigilant. We first stayed quite far trying to figure out her plan, then moved a little closer and so it went on, we managed to have a very safe view as well as not so stressful situation for her and the calf. This month, Tremisana has seen lots of families coming along and I have been overwhelmed to have such nice personalities on drives. One afternoon was remarkable : after driving for about an hour we got radio-called about some elephant sighting. They were still making their way toward the road and so we positioned our Cruiser and waited in silence for the show to start. About 50 elephants that came surrounding us as they crossed to the other side, we just stood there in silence, observing these big Giants, a lot of emotions came at that particular time. We’ve been honoured to see this newly born baby elephant walking along side by his mother and trying to mimic what she was doing with her trunk. We stood there for a very long time before settling on the airstrip to enjoy couple of drinks to let all our emotions flow. Newborn baby elephant and mother. The very next day, I was out again on Sundowner drive and decided to go have a look at Tremisana dam – it was with pleasure that we found 2 young bull elephants, some Kudus as well as Impala. One of these bull was in Musth, and it was most likely to be his first Musth, so he was very unsure of how to react towards us – he simply decided to come closer and gave us a close look. We had him being very cheeky and had to impose ourselves a little by clapping my hand on the door. He moved off then came back, eventually he came past the car with his tail curled inside, just like if you had grounded a puppy. The impalas then gave us a nice opportunity of seeing them drinking water. That very same day, driving on to Barnard’s property we’ve spotted an African Wild Cat that was resting under one of our trees. We’ve been very lucky, as things keeps on improving. My whole time favourite Hyenas have been paying us more and more visits at the Marula Boma, Since I have started here, we used to have 2-3 Hyenas maximum popping in for a visit, but this last month their number has increased – we are now quite often very lucky to appreciate 6-7 hyenas. Our honey badgers as well are becoming naughtier and naughtier as they have now learned to climb on the table where the staff keep the used dishes. Throughout the drives we have seen smaller critters such as Bushbabies, small spotted genet, Pearl Spotted Owlet as well as my famous Chameleons. It was my Kruger day which was quiet but we managed to see four of the big five. H- 7 Pelwane bridge crossed more than 300 buffaloes. H1-3 road to Skukuza Nwaswitsotso loop S 86 two big male lions killed a giraffe. Elephant swimming at Nsemani dam before boom gate on the way back, on the rocks two rhinos a mother and a calf. H1- 3 Nwanetsi bridge 20 metres on the big fig tree a leopard and two cubs feeding on impala and also another before the boom gate. One male lion tried to kill a buffalo then the buffaloes came back and charged the lion. S-126 road just after the waterhole there were twenty seven lions and the cubs. 1km from the Orpen gate again two big male lions crossed the road right in front of us. Kruger day H- 7 road big breeding herd of elephants S- 41 leopard on the Leadwood tree. White lion and pride were lying down at the same road of S – 41. Kruger day Nwanetsi bridge lioness with four cubs of about a week old. In the same area there were buffalos on the river S 86 cross two lionesses. Elephants were all over the place. Kruger day: seven km from the tar road to Xibodwana two big male lions were lying down 5 m from the road and also S-40 from the Timbavati picnic spot two Wild Dogs 2m off the road, near the reception two white rhinos grazing. On the S 147 new road there were 15 lions on the river together with elephants and buffalos in the same river. H- 7 a leopard before Maroela junction lying on a termite mount. 3rd of August was my full day drive in Kruger – it was a good day – sightings excellent, White Rhino before Orpen reception, elephants all over Satara, mating pair of lions before Nsemani dam, leopard on S100 and a herd of buffaloes Xibotwana wind mill and more general game H7. 10th Kruger again : 4 white rhinos at T junction, lions Nsemani dam, buffaloes Ximangwanini dam and more elephants there, rhino after reception to the last boom gate and more general game Sweni road. 15th Kruger again : lions on S36 with Giraffe kill ,more game S100 and Orpen road, more buffaloes after reception and male lion before last gate. 18th Kruger again : lions on T junction s86; more lions Sweni windmill, leopard S41, buffaloes S100,elephants all over and more general game after S90 to Satara camp and rhino near Orpen gate. S28th Kruger again : general game on H7 road, elephants all over, lions Ngotso north and S39 road and hyenas crossing the road, rhinos after reception, buffaloes S 127 road, more general game H7. 3rd at H7 1,5km from Nsemane Dam we found mating lions in the middle of the road. They mated three times within 30 minutes. 5th at H7 500m from NsSemane dam we found a pride of 8 lions feeding on a buffalo two male walked away from the carcass and walked right in front of us. 9th at H1-3 4km from Kumane dam we found 2 male lions feeding on a giraffe then a female one came trying to join them. But they chased her off. She rolled on the grass and the male identified that she’s part of the pride by smelling where she was rolling, and then they let her come and eat. 15th at H7 about 2 km before the reception we found a male leopard trying to catch an impala. Lots of cars so the impala saw him and ran off. 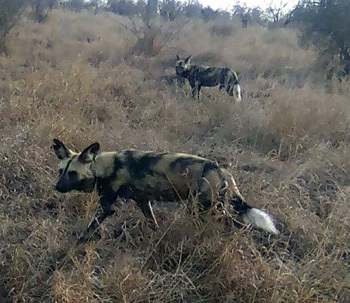 25th at S 40 2km from Timbavati picnic sport we found wild dogs – two walked close to us. Wild dogs on the move. Generally good with regular sightings of hippo and crocodile along river and elephants. We have also been seeing a large herd of buffaloes. Black rhinos have been seen irregularly on Rome 1. 6 bulls elephants on campfire property have provided regular sightings. On a sunset drive and we found a herd of elephants on Rome 1 and 2 lions asleep on the Olifants road. From our platform, we got some hyenas, a herd of buffaloes, honey badgers as well as a pride of lions. The lions had killed a buffalo and we woke up from the noise the buffalo was making. During the afternoon walk as part of the sleep out safari we saw and approached kudus and giraffes. 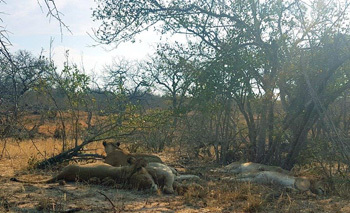 We slept another night out close by the Boma, and we heard the lions calling the whole night – on the way back to the lodge we came across 3 big male lions on Olifants road. This has been an amazing month filled with breath-taking sightings of various antelope species and some interesting big five encounters. I have also noticed an increase in bird species as we welcome back some of our migratory birds for the upcoming spring and summer seasons. I mostly do morning and afternoon drives and the occasional Bushwalk – on these drives I have had amazing encounters with elephant; lion; rhino and buffalo. My favourite encounters was of an Elephant bull showing interest in the vehicle and giving us a nice up close look before moving off to the side; one particular drive we experienced amazing giraffe sightings drinking water and a female Hippo with her baby in the Tshikamba dam showing off her large teeth; I have also had amazing close encounters with our local Pride of 8 lions right next to the vehicle on the side of the road resting in the midday heat. Lion pride resting in the midday heat. I encountered buffalo on one of my afternoon drives passing through Campfire and my guests were pleased to have a closer view of them compared to the sighting they had the night before. We encountered a female black rhino and her calf crossing the road when driving back from the Bushwalk. I especially enjoy the afternoon drives as it gives me the opportunity to track various animals and allows me to look at the different areas increasing the chances of finding more amazing sightings. I enjoy the bushwalks as they also focus more on the educational and traditional aspects of nature; every now and then coming across elephant playing in the river and the pod of Hippos relaxing in the water. I also did a few sunset drives and encountered bachelor herds of elephant and two female lionesses sleeping about 6 metres from the road on the Rome 1 property. Overall my guests were pleased with their drives and enjoyed their experience even on the quiet days where we did not have many sightings; on these quiet days I enjoy incorporating things such as the termite mounds; the medicinal uses of some plant types and also territorial markings such as scratching on trees and middens as well as explaining tracks to the guests to keep the drive interesting and the guests involved. Dry season is already on us – animals are experiencing a minor nutritional crisis. Elephants are getting so hungry that they are breaking into our lodges- on 31 August we had 30 elephants inside Tremisana property – guests thought it was a blast from heaven – next morning place was a mess !!! For Kruger Park sightings, we had an awesome month with so many lions and so many kills lately, most near the water holes. 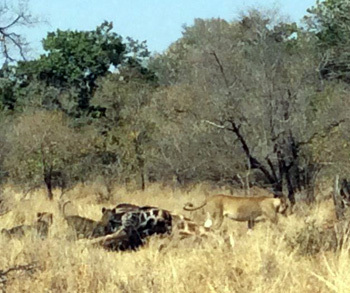 A pride of about 15 took down a male giraffe on the S36 near Nwenyeni water hole. There were a few cubs that kept on playing on top of the dead giraffe while the big lioness and males were busy feeding. This sighting that lasted about 3 days which brought so much joy to our guests as it was very simple for us guides to get lions. Moving towards Kumana Dam we found a cheetah near a breeding herd of impalas with the baboons on top of a sausage tree. The cat took its time to strike as it was trying to spot or isolate the weaker one. The baboons came down from the tree and saved the impalas from the cheetah. On the S90 another pride of lions took down a wildebeest and two males were busy feeding with the rest of the pride watching hungrily. A few km on a leopard had a dead impala in a tree. The next day a lioness took down a kudu on the very same road, while on the S100 we found another pride of lions stalking impalas next to the river. On Balule nature reserve, we found a breeding herd of elephants on foot while doing a bushwalk near the Olifants river – they looked so relaxed while foraging next to the river. Our Sunset drive was so interesting – when we finished the Bush BBQ at Marula Boma, we came across a pride of lions which consisted of lionesses only. We followed the pride right up until they crossed into our property and moved to Tremisana Dam. It looked like they were hunting. August has been yet another great month ! 6th : Our Kruger day began like all the others – with paper work and some coffee. Going in at Orpen gate we found a leopard 500m between the two boom gates lying down next to the road ,observing Impalas in the distance. What a start ! We continued and found lots of general game with Elephants and a big herd off Buffalo in the Timbavati river. On the S100 we got lions – two big males lying down but on our way there one off my guests spotted a White Rhino wow ! When we got to Satara we had a great lunch and saw Elephants coming close to the fence feeding of some of the trees. After lunch we went up North on the H1-4 driving to S127 where we saw loads of elephants, estimated 500 in total. On the S127 we found Ostrich male and female standing together. We went to Timbavati picnic spot as the guests needed a bathroom. When we arrived there, the attendant told us about lions lying on the banks of the Timbavati river – what a spot ! Along the S40 we viewed loads off general game and Leopard right at the end. 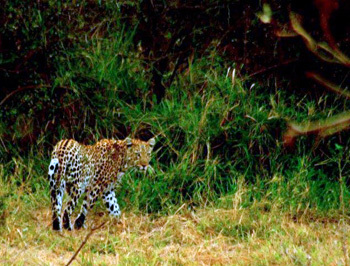 Leopard along the Timbavati River. TREMISANA has had a new fence erected as the elephants made a mess of the previous one. We are now switching on the electricity on the fence at around 17h00. It has a voltage of 8800 V so guests need to be made aware of the potential danger. There are many more animals coming to drink at Tremisana Dam as it is the only water within a radius of 7 km. With the shortage of fodder, the animals come in and out fairly quickly. Lions are coming just about every day. They stay long only when they make a kill. We are building a new storeroom. KATEKANI has had new thatch covers over the entrances. We have procured a new restaurant-style coffee machine – it apparently makes Cappuccino to die for. We also installed a new convection oven. MASANGO CAMP has had all renovations complete including two new staff rooms. 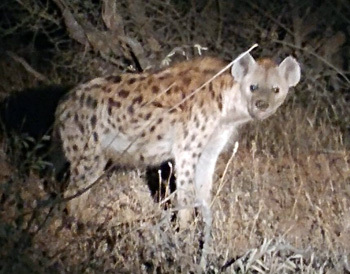 Hyena are frequent night visitors. Nocturnal visitor at Masango Camp. MARC’S TREEHOUSE LODGE has had some brilliant sightings – the young male Black rhino is seen regularly and seems to be very relaxed near excited guests. Buffalo sightings along the Klaserie River are common and we have seen them on most Bush Walks. There was a slight drop in numbers compared to August 2016 – I am told this is universal. Nevertheless we had over 420 guests this month. A lot of Italians came through and we were complimented on the Spaghetti Bolognese at Tremisana. Well done to our 3 chefs there – Delina, Pierre and Paulina. Bravi !!! I read many reviews of several different companies before booking a South Africa safari with my partner. I did see some particularly negative reviews on Viva Safaris & Tremisana Lodge/Marc’s Treehouse Lodge, but I can now say with 100% confidence that these reviews are completely unfounded. The staff at Viva Safaris is so top-notch that you walk away knowing that every cent was extremely-well spent. We ultimately chose the six day, five night lodge/treehouse package. One night was spent at Tremisana and the other four at Marc’s Treehouse. After the drive with extremely friendly staff (Solly & Lucky in particular) from Johannesburg, you hit the ground running and do not stop until you say goodbye. Every day was filled with delicious food & excellent game viewing. We especially enjoyed seeing the difference between private game reserves and Kruger National Park. I feel we formed a bond with so many other safari goers as well as the staff & guides, it was hard to say goodbye! I will recommend this company and package to anyone who asks for many years to come. Thank you to everyone at Viva Safaris, and please keep up the excellent work!! We enjoyed our 2 evenings at Marc’s treehouse. Victor, who greets you with a smile, provides all the information you need and was always willing to answer questions. Our treehouse overlooked a watering hole and we were able to hear lions overnight. Walking to breakfast or dinner it was not uncommon to walk by impala or monkeys. The food was simply delicious and the staff that served the meals always did so with a smile. It’s a communal style dinner – so we had the opportunity to meet and dine with people from all over the world, making it even more special for our family. Abbiamo prenotato il pacchetto “sleep out Safari” di viva safaris, e ne siamo rimasti entusiasti! Autisti, guide e staff molto disponibile ad accogliente: ogni attività era perfettamente organizzata, sia per quanto riguarda i trasporti che le attività in sé. Le notti sotto le stelle, circondati dai suoni della natura sono state indimenticabili, e le raccomandiamo assolutamente. Non ci siamo minimamente sentiti in pericolo, avendo una guida con grande esperienza sempre con noi. I Safari, sia a piedi che sulle jeep aperte, sono stati molto avvincenti, abbiamo visto moltissimi animali a distanza ravvicinata, e le guide ci hanno fornito informazioni molto accurate e coinvolgenti. Abbiamo soggiornato solo una notte presso il marc’s treehouse lodge, e ne siamo rimasti molto soddisfatti. Avendo dormito fuori le notti precedenti, ci è stata data la possibilità (gratuitamente) di fare un upgrade alla treehouse, che è veramente bellissima! Molto curata, accogliente, e dotata di ogni comfort. Vale decisamente una visita!!! 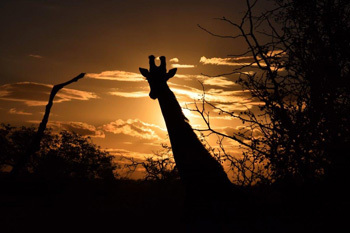 We booked the package “sleep out Safari” of Viva Safaris, and we were thrilled! Drivers, very helpful to friendly guides and staff – any activity was perfectly organized. The nights under the stars, surrounded by the sounds of nature are unforgettable, and absolutely recommended. We did not in the slightest feel unsafe, having a guide with great experience with us always. The Safaris, both on foot and on the open jeep, were very exciting, we saw lots of animals at close range, and the guides provided us with very accurate and engaging information. We stayed only one night at Marc’s treehouse lodge, and we were very satisfied. Having slept out the previous nights, we were given the opportunity (for free) to do an upgrade to the treehouse, which is really beautiful! Well cared for, welcoming, and equipped with every comfort. Definitely worth a visit !!! Through Viva Safaris, we had a 4 day stay at Katekani Lodge. And it was absolutely amazing! I’d have to say it was by far my favourite holiday experience. The staff were extremely warm and welcoming and it felt like a big family there. The amazing chef would prepare all meals and we arrived to a beautifully set table each morning and evening with other guests and the tour guides. The rooms were great… Truly Glamping!! I highly recommend it to all! !